The latest release of AgileBits's popular digital vault take full advantage of everything your iPhone, iPad, and Apple Watch have to offer. As it is often the case with the release of a new major version of one of Apple’s operating systems, a fresh new version of AgileBits’s 1Password for iOS (App Store link) has hit the virtual shelves of the App Store. 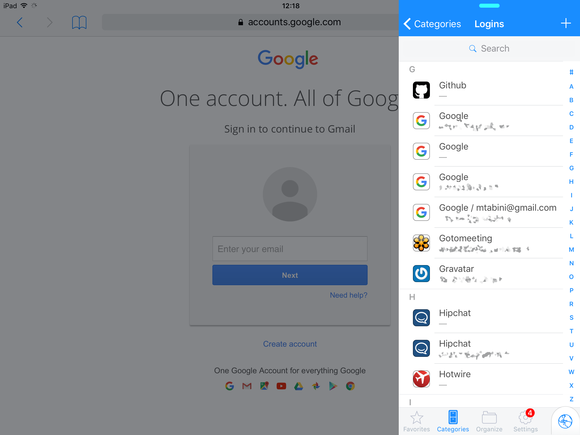 1Password’s built-in browser has received quite the makeover, although its functionality is largely unchanged. Like its recent predecessors, 1Password 6.0 can be installed at no cost and is a free upgrade for existing users, although certain functionality can only be accessed as part of a “Pro” version, which comes in the form of a $10 in-app purchase. Of course, it also comes jam packed with many new features. 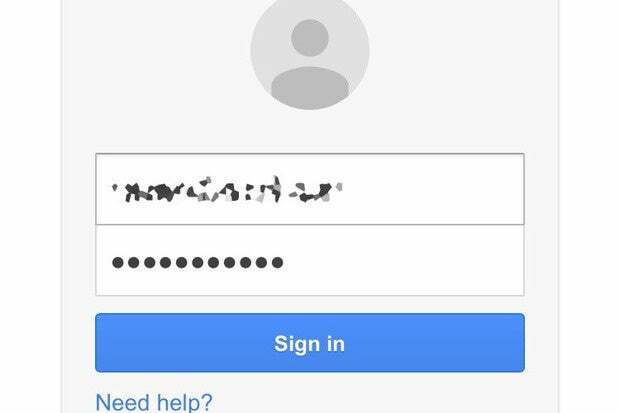 First, the basics: 1Password helps you save various bits of private data—logins, credit card numbers, software licenses, and so on—inside a “digital vault” secured using military-grade encryption algorithms and protected by a single passphrase of your choosing. 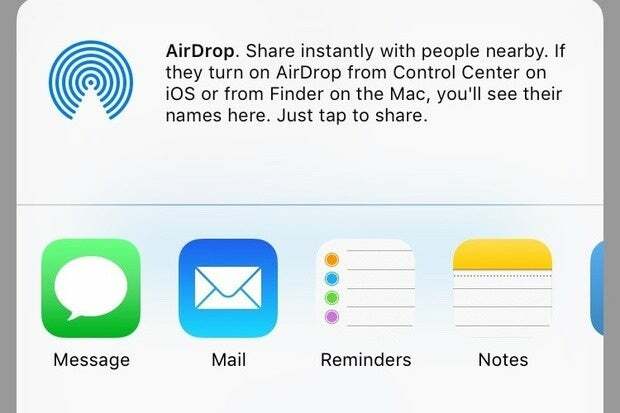 You can then sync this data among your devices using one of several cloud services like iCloud and Dropbox, and have it ready at your fingertips whenever you need it. If you’ve used 1Password in the past, you’ll find that version 6 carries a familiar feel: the designers at AgileBits have given its user interface a bit of makeover, but their work has mostly been limited to tweaks and improvements, as opposed to drastic changes. For example, the built-in browser, which allows you to use the data stored in your digital vault to automatically login to websites and fill-out forms, now features a light theme that’s a bit easier on the eyes, but otherwise works in pretty much the same way as its version 5 counterpart used to. Integration with iOS 9’s Spotlight makes finding data stored in your digital vault a breeze (don’t worry—you still need to unlock 1Password before actually accessing the data). As you can imagine, a program like 1Password is only useful if it’s easy to access and use; after all, nobody wants to continuously switch back and forth between it and another app to copy and paste individual bits of information by hand. Unfortunately, the many limitations that Apple imposes on the iOS ecosystem have, in the past, severely limited AgileBits’s ability to make 1Password play well with other apps. This problem was somewhat mitigated by the built-in browser, but only as far as the Web was concerned—and, even then, it meant limiting your ability to use Safari or Chrome to visit your favorite websites. 1Password integrates well with Safari, thanks to a handy native extension that offers quick access to saved logins and form data. 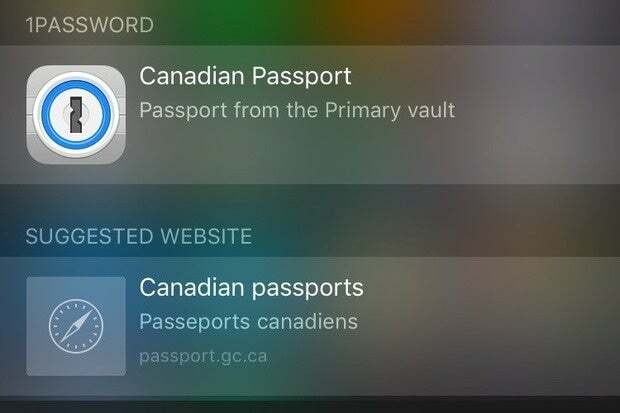 Apple’s tight grip on its mobile operating system, however, has been loosening for some time, and 1Password’s integration with its features has improved as a result. 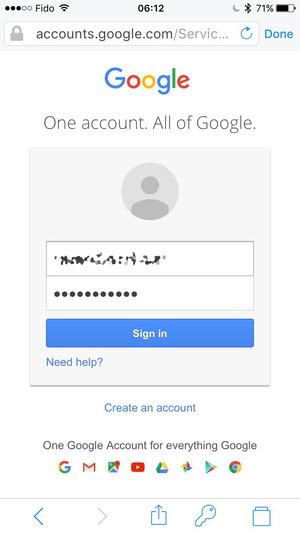 For example, Touch ID has been supported as a, uh, handy alternative to vault passwords since version 5, which also came with a Safari extension capable of automatically filling logins and forms using information from your private stash. Version 6 ups the ante in this department with two notable additions. 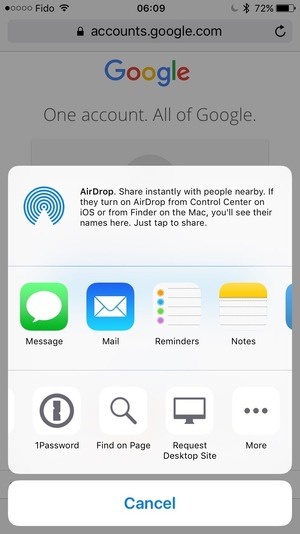 The first is integration with Spotlight, which makes it possible to search the contents of your digital vault directly from the Home Screen. This is more useful than it seems once you consider that 1Password can be used to store items like two-factor authentication tokens, loyalty card numbers, and even identification credentials—all data whose convenience is directly proportional to the ease with which you can find and access it. On the iPad, 1Password now also comes with support for iOS 9’s new multitasking features, which make copying data to and from compatible apps easier than ever. On the iPad, 1Password supports iOS 9's new multitasking feature, making working with secure data side-by-side with another app much easier. 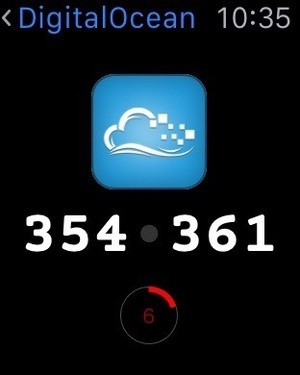 Is that a passcode on your wrist? If your iPhone is paired to an Apple Watch, and you own the Pro version of 1Password, you can also synchronize an arbitrary number of items from your digital vault onto your wrist. 1Password can synchronize your data to the Apple Watch, too—a feature that comes in handy for many uses, like dealing with two-factor authentication tokens. This feature, which first became available in version 5 and has now been expanded to work with all kinds of secure data, is enormously useful. For example, I keep several of my two-factor authentication credentials stored on my watch, making logging on to the corresponding services and websites much easier. My passport information is also on there, and that saves me having to fumble with my briefcase whenever I’m filling out paperwork at the airport. Interestingly, 1Password offers its own optional passcode on the Apple Watch. This clever solution gives you the flexibility of turning off Apple’s built-in code if you so prefer, while still protecting the kind of sensitive information that tends to live inside your digital vault with an extra layer of security. This is not my first rodeo with 1Password; on top of being a longtime user, I am, if my calculations are correct, reviewing one of its incarnations on Macworld’s pages for the sixth time. While I’ve always loved the desktop version of AgileBits’s app, its mobile counterpart has, until now, been hard for me to warm up to, mostly because the features that make it so convenient on the desktop, such as quick access to my data and the tight integration with many other parts of the operating system, were missing due to iOS’s more restrictive security environment. To make matters worse, Apple itself has been slowly eroding 1Password’s raison d’être, since basic functionality like password and credit card storage is now baked right into the Keychain, which, of course, enjoys a privileged level of integration with the operating system that third-party software has no access to. 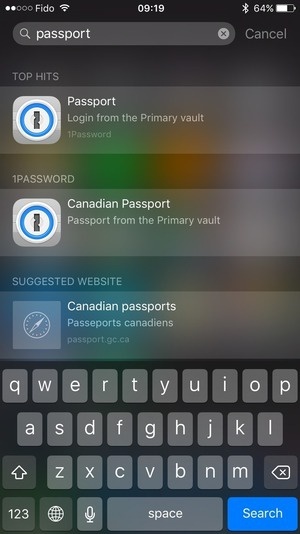 With this latest version, however, the app makes full use of everything that iOS has to offer, and reaches a whole new level of usefulness, particularly when it comes to quick access through Spotlight and interaction with the Apple Watch: no longer a somewhat inconvenient way to look up a password in a pinch, 1Password has finally reached par with its desktop cousin.